It’s time to order your poinsettias for the upcoming holiday season! The PAC Poinsettia Fundraiser is a way you can help to raise the necessary funds that allow us, as parents, to purchase essential supplies, and support the many programs at Hamber. You can place your poinsettia order online before November 20st using Munchalunch.com. Payment is by credit card only. 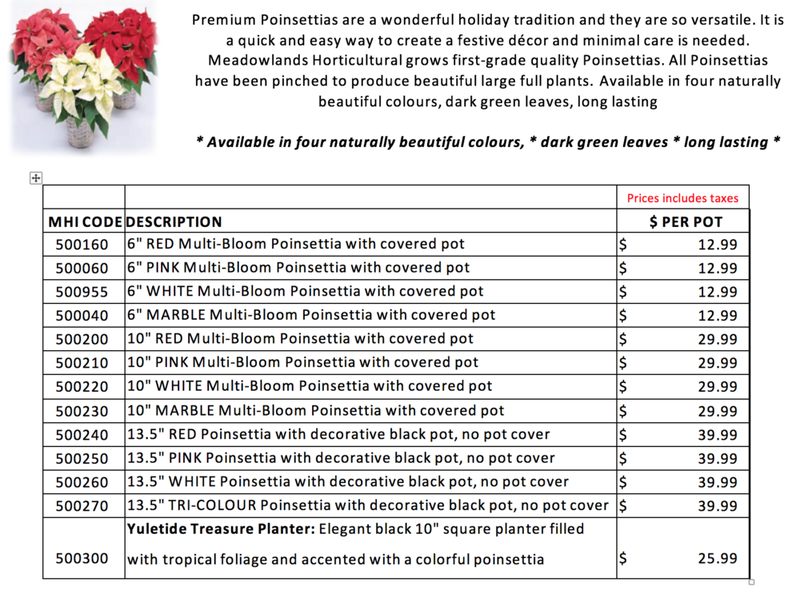 We encourage you to sell poinsettias to you family, friends, neighbours, and local businesses! Simply go to http://munchalunch.com/schools/erichamber and click “register here” to open a new account. Follow the prompts, add your student’s name and grade (twice), and place your order! Only online orders will be accepted. The price list is below. ALL prices are inclusive of taxes. Payment is by credit card (VISA or MasterCard) only. Once your order is placed, there are no cancellations or refunds. ALL poinsettia orders must be paid in full and picked up in person at the school on Thursday, December 6th between 2:00 and 7:00pm or Friday, December 7 between 7:30 and 9:00 am. The exact pick up location will be announced at a later date. After 9:00am on Dec 7, all unclaimed plants will be donated to charity. Thank you for supporting our first school fundraiser of the year! Doors will open at 6:00 for all with presentations beginning at 6:30. These talks are geared to parents and teachers who are interested in learning how education changes the brain. They will provide information on what behaviours improve brain health and promote learning, how bilingualism affects cognitive function and how social and emotional learning impacts education and achievement. * All proceeds will support students of Laura Secord Elementary and help fund a Quebec Exchange for those in French Immersion. A relaxed evening where we refresh our knowledge on adolescent development (the social, emotional, intellectual changes) and look at some of the science behind teen behavior and thinking. We’ll explore communication strategies that work with these changes, so that we can reduce tension at home and strengthen our teenagers capacity and responsibility as they mature. All parents are welcome. An opportunity for adults to add to their knowledge about youth, cannabis and alcohol. We’ll also touch on vaping, other substances, partying and teen development to support adults in not only talking with teens but also supporting healthy choices and changes. The evening is friendly and non-judgmental, and focuses on both facts about different substances and ways to talk with youth so that we don’t get shut down. The BC Ministry of Education has produced a SOGI Policy Guide to help ensure students have a safe, welcoming and inclusive learning environment. Here is the SOGI Report from the BC Confederation of Parent Advisory Councils for your reference. SACY is putting on a few workshop between March 8th and May 31st. If you are interested in attending their SACY Adult Toolkit: Understanding Youth & Substance Use or Building Bridges with your Teen workshops, registration info can be found here. Thank you Stong's Market for supporting our school! When you place an online order with Stong's, they donate 4% of that order to the school of your choosing. This year Frank from Stong's Market presented a cheque to us for over $500 at our February PAC meeting. Thanks Stong's and to the customers who supported our school! Find out more about their online shopping rebate here.